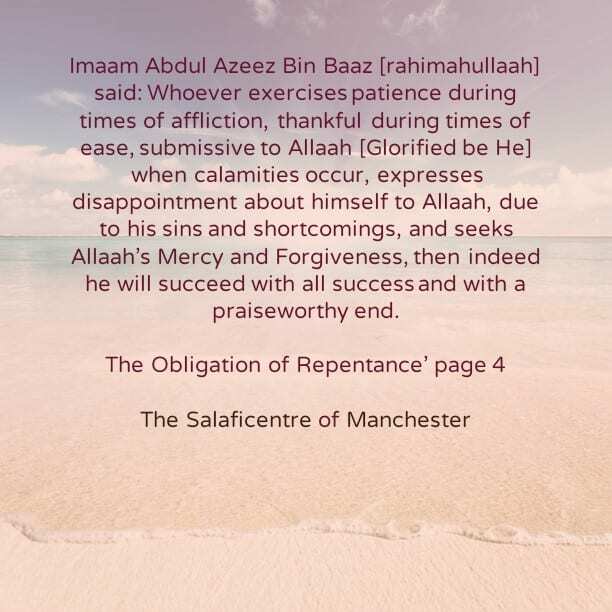 Imaam Abdul Azeez Bin Baaz [rahimahullaah] said: Whoever exercises patience during times of affliction, thankful during times of ease, submissive to Allaah [Glorified be He] when calamities occur, expresses disappointment about himself to Allaah, due to his sins and shortcomings, and seeks Allaah’s Mercy and Forgiveness, then indeed he [or she] will succeed with all success and with a praiseworthy end. And what this means is that Allaah decreed the Hasanaat and Sayyi’aat in order that the people may return to the truth, hasten to repent from what Allaah has made forbidden for them and rush towards obedience to Allaah and His Messenger. That is because disbelief and sins are the cause of every affliction and evil in this life and the next. In this noble ayah, Allaah urges His slaves to have the desire to humble themselves to Him and show their need of Him. And that they should ask Him for succour when visited with calamities such as illnesses, injuries, killing, earthquakes, hurricanes and other calamities. This is the meaning of the ayah: [فَلَوْلَا إِذْ جَاءَهُم بَأْسُنَا تَضَرَّعُوا -When Our Torment reached them, why then did they not believe with humility], meaning: why did they not humble themselves when our torment came to them. 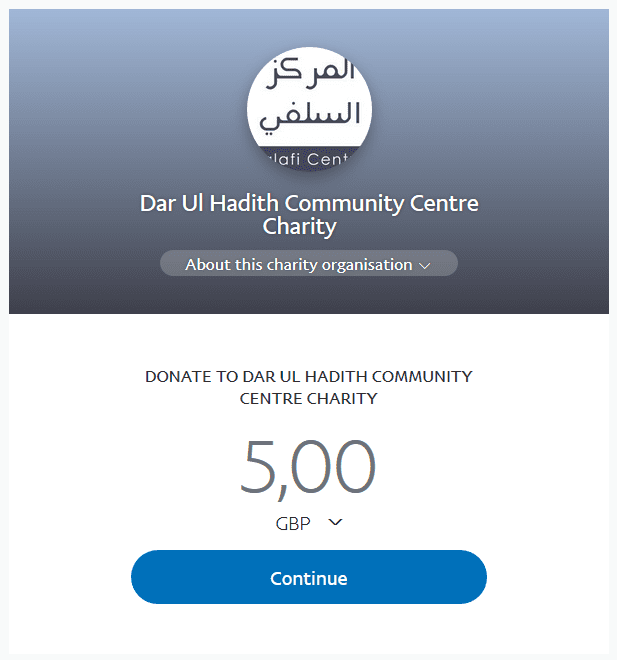 And it has been reported about the Rightly Guided Khaleefah [The Chief of the Believers] Umar Bin Abdul Azeez [rahimahullaah], that when an earthquake occurred during his time, he wrote to his governors and commanded them to command the Muslims to repent to Allaah, humble themselves before Allaah and seek forgiveness for their sins. O Muslims! You are aware of the various trials and calamities that have occurred in this era of ours- from them are the earthquakes in Yemen and in many other lands, the destructive floods, the hurricanes that destroyed a lot of wealth, trees, sea transportation, the various snow falls that brought about innumerable harm, and the starvation and drought in many lands. All this and the various punishments and calamities similar to them are as a result of disbelief, sins, deviation from obedience to Allaah, [sinful] engagement with the Dunyah and its fleeting lusts, turning away from the hereafter and not being prepared for it, except for the one upon whom Allaah bestows His Mercy amongst His slaves. No doubt these calamities and other than them should make the slaves rush towards repentance to Allaah [Glorified be He] from all that Allaah has forbidden, and they should hasten towards obedience to Allaah and judge by His Sharee’ah. They should co-operate upon righteous and piety, and enjoin one another upon the truth whilst exercising patience upon that. And may peace and blessings be upon our Prophet Muhammad, his family, his companions and those who follow them in goodness till the Day of Judgement.